anonymus (Stade, 18. Jh. ?) Choralbearbeitung "Du Friedensfürst Herr Jesu Christ"
The organ in Grünendeich was built in 1766 by Dietrich Christoph Gloger, who was next to Schnitger one of the most important organ builders between the Weser and the Elbe. For a long time it was in extremely bad condition, due to extensive changes made to it in the 19th and 20th centuries. In 2009, however, it was possible to celebrate the restoration of the Gloger organ done by the organ builder Rowan West, who restored it and completed it in Gloger's style. 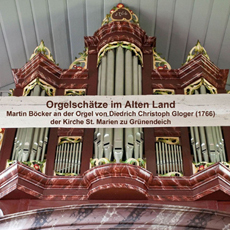 In a musical portrait of the organ, Martin Böcker presents the tremendous variety of colours it can produce. With music by Dietrich Buxtehude, Johann Sebastian Bach and Johann Kuhnau he demonstrates the traditional side of the instrument. Included is the entertaining Biblical Sonata in eight movements, “Der Streit zwischen David und Goliath” (“The Battle between David and Goliath”) by Johann Kuhnau, J.S. Bach's predecessor in Leipzig. Kuhnau, also a writer, retold the biblical tale in his own words. This story is also on the CD, narrated by Peter Golon. The more modern side of the organ (suitable to when it was built in 1766) is presented by Böcker with Georg Philipp Telemann, Johann Wilhelm Hertel and Johann Christian Kittel. August 2011 shall see the completion of fundamental restoration and reconstruction works on the Schnitger organ in Hollern, Altes Land. This instrument can also be heard on CD from 2012 as part of the series “Organ treasures in “Altes Land””.